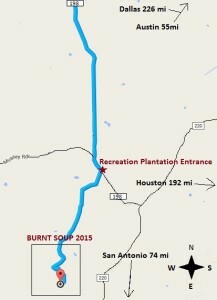 Location - Burnt Soup TX! 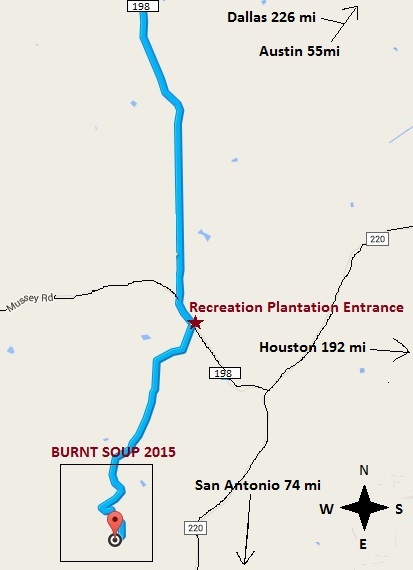 Burnt Soup 2018 will be held at Recreation Plantation. From Austin – Take Hwy. 290 West to Dripping Springs. At the red light (Ranch Rd. 12 & 290) continue west four more streets to Creek Road. Turn left (just before Diamond Shamrock). After about 1 mile, go left at the stop sign. Go another 1 mile and veer left (the road will be Co. Rd. 220 / Mt. Gainor Rd.). Stay on Mt. Gainor Rd. 6 miles to Co. Rd. 198 / Pursley Road. Turn right onto Pursley Rd. Continue for 1/2 mile to mailbox #3550. (Look for a nice 2-story blue house on left with rock entry.) Turn left at the mailbox onto dirt road and continue 7/10 mile. Road will dead end into campground. Enter double gates straight ahead. From Houston and points in the direction of Houston – Take Hwy I-10 West of Houston past Columbus. After you’ve passed Columbus, exit onto Hwy. 71 to Austin (about 1-1/2 to 2 hours). You will pass La Grange, Smithville & Bastrop before you get to Austin. In Austin, stay on Hwy 71 / Hwy 290 W. until you get to Oak Hill. In Oak Hill at the (H-E-B) intersection of Hwy. 71 and Hwy. 290, go straight ahead on Hwy. 290 W. to Dripping Springs (about 30 minutes). At the light at Hwy. 290 & Ranch Road 12, continue west on 290 4 more streets and turn left onto Creek Road. After about 1 mile, go left at the stop sign. Go another 1 mile and veer left (the road will be Co. Rd. 220 / Mt. Gainor Rd.). Stay on Mt. Gainor Rd. 6 miles to Co. Rd. 198 / Pursley Road. Turn right onto Pursley Rd. Continue for 1/2 mile to mailbox #3550. (Look for a nice 2-story blue house on left with rock entry.) Turn left at the mailbox onto dirt road and continue 7/10 mile. Road will dead end into campground. Enter double gates straight ahead. From San Antonio and points south – Take Hwy. 281 North from San Antonio through Blanco. Continue North on 281 approximately 8 miles. Turn right onto Hwy. 290 East. Take 290 East to Dripping Springs. At 2nd Diamond Shamrock Station, Turn right onto Creek Road. After about 1 mile, go left at the stop sign. Go another 1 mile and veer left (the road will be Co. Rd. 220 / Mt. Gainor Rd.). Stay on Mt. Gainor Rd. 6 miles to Co. Rd. 198 / Pursley Road. Turn right onto Pursley Rd. Continue for 1/2 mile to mailbox #3550. (Look for a nice 2-story blue house on left with rock entry.) Turn left at the mailbox onto dirt road and continue 7/10 mile. Road will dead end into campground. Enter double gates straight ahead. From Dallas and points north – Take I-35 South to Round Rock. In Round Rock, take exit to 1325. Turn right on 1325. Stay on 1325 about 15 minutes and it will become Mopac/Loop 1. Stay on Mopac/Loop 1 for about 25 miles and then start looking for 290/71 West. Get on 290/71 and go about 5 miles. Take 290 west to Dripping Springs. At the light (Ranch Road 12 & Hwy. 290) continue 4 more streets and turn left onto Creek Road (just before Diamond Shamrock). After about 1 mile, go left at the stop sign. Go another 1 mile and veer left (the road will be Co. Rd. 220 / Mt. Gainor Rd.). Stay on Mt. Gainor Rd. 6 miles to Co. Rd. 198 / Pursley Road. Turn right onto Pursley Rd. Continue for 1/2 mile to mailbox #3550. (Look for a nice 2-story blue house on left with rock entry.) Turn left at the mailbox onto dirt road and continue 7/10 mile. Road will dead end into campground. Enter double gates straight ahead.